Tomatoes, zucchini, cucumbers, bell peppers. Loads of cherry tomatoes will be used to make tabouleh. Cherry tomatoes are the first to ripen, sometimes a month ahead of the big tomatoes. By the time plenty of beef steaks are producing, Cherry tomatoes can go right into the food dehydrater, becoming sun-dried tomatoes. I planted a sun gold cherry tomato. A friend sent seed for the white cherry and, the red tomato is a volunteer. The Sun Gold is sweet and prolific. It would have been all the little cherry tomatoes we could eat with plenty to dehydrate as sun-dried tomatoes. But, they are so good that a lot of them never make it to the kitchen. We eat some of them as we pick them. Where the Sun Gold grew last year, a volunteer came up this spring. Curiosity is the only reason this little guy was allowed to grow. It may be just like one of sun gold’s parents, but who knows? The volunteer did not grow up to be a Sun Gold. No surprise there. Sun Gold F1 means this is a tomato hybrid. Don’t save the seed, because there’s no guarantee the plant will produce true Sun Gold tomatoes. That volunteer tomato is producing loads of 1″ red cherry tomatoes. They are not very sweet but there sure are lots of them. The white one is a sweet, ivory colored cherry tomato. Not a heavy producer, but it is pretty in a pint of mixed color cherry tomatoes. My best guess is that this white cherry tomato is Snow White. Traditionally tabouleh uses full-sized tomatoes, finely chopped parsley, mint, and onion, and seasoned with olive oil, lemon juice, and salt. I make it my own by using cherry tomatoes. Zucchini bread is in the oven. Can you smell it? That dark zucchini hiding under all the other produce, is Raven. Usually I pick them when they are 6 or 7 inches long. This one got away from me while I was away for the weekend. These dark green, smooth-skinned summer squash are a Renee’s Exclusive. I will use this hefty zucchini grated into zucchini cake and chocolate zucchini bread. Tomatoes and peppers are easiest and most popular home grown vegetables. When my favorite Canadian cousin asked for advice and gardening suggestions, I thought about NicholsGarden Nusery. I’ve been ordering from Nichols for 20 years. Cousin Sheila wanted to know what seeds would be good for her friend, a new gardener in Alaska. They raise cabbage in Alaska that make my Missouri crop look like Brussels Sprouts. The first people I would turn to if I wanted to know about gardening in Canada are her parents, my Uncle and Aunt. Nobody knows Alaska gardening better than Jeff Lowenfels. His column in the Anchorage Daily News is helpful for all gardeners, especially Alaskans. I was going to suggest some of the best catalogs for colder climates, but Jeff’s suggestions are exactly what I was going to suggest. Seed Catalogs for Alaska gardeners. Cold Climate Gardening is one of the best. Rose Marie sent seed, and I grew little blue tomatoes last summer. So, I grew beautiful little saladette Indigo Rose tomatoes. If I was a new gardener, I’d buy a couple of tomato plants and a pepper plant. Then, I would grow leafy greens from seed. 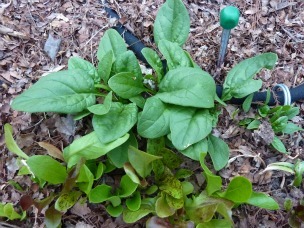 Lettuces to start, then chard, kale, and/or spinach. 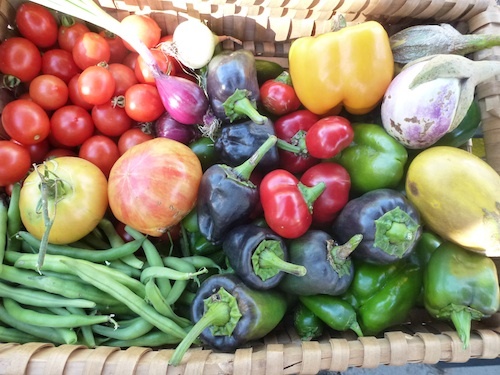 Or, if I am planting a first garden in Alaska, I might grow these vegetables from Nichols. Rose Marie Nichols McGee has a great blog on the Nichols site, The Gardener’s Pantry Blog. Why? Because you get a lot of different salad greens, all in one packet. Why? Because there a several colors and all taste the same (not hot). 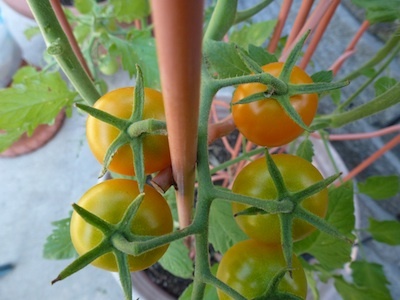 Tomato: Sun Gold – The sweetest cherry tomato ever. 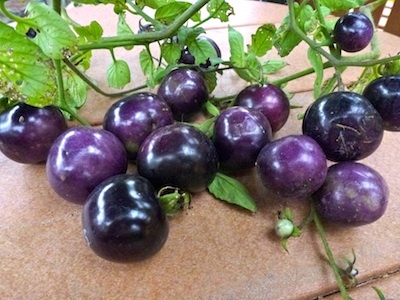 Tomato: Oregon Spring – Large early fruits from compact plants. Squash: Jackpot Zucchini – early, non stop production. Cucumber: National Pickling – compact, small for pickling and fresh. Another choice for a first garden: Tomatoes, squash and green beans are a good starter garden. I’ve gown these plants in my garden, and they will do well in Alaska too. These seeds are from Renee’s Garden. 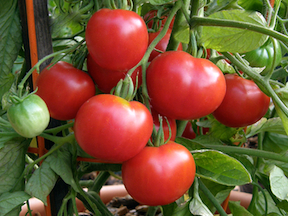 Tomato: Stupice – Early bearing, cold tolerant, with richly flavored fruits on short vines. Heirloom. Tomato: Italian Pompeii – loads up early with heavy harvests of meaty plum tomatoes. Tomato: Little Red Pear – vigorous vines load up with clusters of petite pear-shaped ruby-red fruits. Heirloom. Green Beans: Rolande – French “haricot verts”, long skinny, tender full flavor green beans. Green Beans: Provider – Great tasting, highly productive and reliable variety. Heirloom. Squash: Tricolor Mix – three beautiful zucchini summer squash in one packet. Join Renee’s Comunity Garden. Find fellow gardeners and get your garden questions answered here. I’ll see you at Renee’s Community Garden. What is a F-1 tomato? The most prolific tomato in my garden is ‘Tomaccio’™. Cluster after cluster until frost. ‘Tomaccio’™ originated at Hishtil Nurseries in Israel as the result of a 12 year breeding program using wild Peruvian tomato species to create the world’s finest, sweetest snack tomato, fresh or dried. Europeans in France and Germany have been growing and enjoying tomato ‘tomaccio’ for several years. These tomato plants are huge, about 7′ tall, so I trimmed the tomato plant and hung some of the tomato vines to dry to show you how to do it. Tomaccio are the first tomatoes to ripen, continuously producing cluster after cluster of fruit. I’ve been drying cherry tomatoes for many years because I love the intense tomato flavor in winter soups, on pizza, and in spaghetti sauce. Tomaccio are rich and sweet fresh off the vine, drying simply intensifies their flavor. Living next the Mississippi River, the air is usually too humid for fruits to dry naturally, but a 5-tray food dehydrator makes fast work of drying cherry tomatoes. I cut each tomato in half and fill the trays in a single layer. You can also dry tomatoes in an oven on 100-degree F for about 3 hours. Snack on the dried tomaccio or store in a plastic zipper bag in the freezer. C. Raker & Sons partnered with the Israeli firm Hishtil to bring Tomaccio to the United States. Look for Tomaccio plants at independent garden centers next spring, or visit www.raker.com to find a retail source near you. As a member of the Garden Writers Association, I had the opportunity to trial Tomaccio this summer. These plants are prolific. I think I am getting more tomatoes from a single Tomaccio plant than I would from three or four cherry or pear tomato plants. That’s more produce in less garden space. The plants continue to grow and produce sweet cherry tomatoes. Later, I’ll have more details about drying Tomaccio.